Living here in the Conejo Valley, we have many factors that can affect our pool chemistry and upset the proper balance that gives you fresh and clean water. You want your pool and spa water to be safe and enjoyable and these 10 items can be problems for your pool water. We see a lot of problems when the Santa Ana winds arrive here in our area. It delivers a new supply of dust, dirt, leaves, plastic bags, and all sorts of other debris right to your pool. It’s good to know that debris that is organic, such as leaves and grass cuttings, will put a load on your filtration system and chemical balance. It’s always a good idea to clean and skim your pool frequently when the winds arrive and on a regular basis even when the winds are not high. Did you know that when your pool’s temperature rises chlorine will break down faster? Bacteria grows in warmer water and when there is more bacteria, the chlorine is consumed and used up. Also, when your pool temperature is higher scaling is more common. This is why it’s important to keep the proper chemical balance in your pool and spa. Most people find 85° is a comfortable temperature for swimming. It’s recommended for health reasons to keep spa temperatures below 104°. Most heaters will not exceed this temperature. It may surprise you, but your shampoo, sunscreen, hair gel, hair spray, perfumes, and soaps can throw off your pool water’s chemical balance. Our clients are often shocked when we show them how much this issue can change the water. It’s why we recommend that swimmers shower BEFORE getting in the pool too. And, by the way, don’t stop using your sunscreen just because it affects your pool chemical balance. It’s always important to protect your skin, so maybe wait a few minutes after application to let it soak into your skin more. Here in Ventura County, some neighborhoods don’t have the best tap water for pools. And the water you supply to your pool can change your chemical balance considerably. It’s important to monitor your water’s chemical balance after you’ve added a substantial amount of water to your pool or spa. Stagnant water is an enemy to clean water. 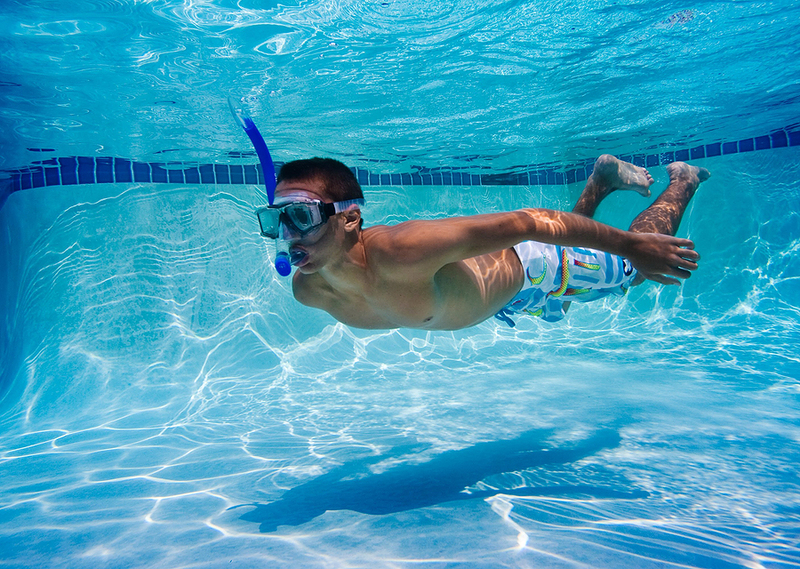 The circulation of your pool’s water is critical to keeping the water clear and clean. Our staff recommends that you set your pump to circulate 100% of your pools water per day (about 6 hours for most pools) to help keep your pool clean. We don’t see a lot of rain here in Southern California, but when we do it can affect our pool’s chemical balance. This is because rain water is more acidic and it will lower your pool’s water pH balance. When your pool or spa water gets below about 7.2 Parts per Million, it can cause problems with your pool’s equipment from corrosion. Also, swimmers will tell you it’s uncomfortable to swim in a pool with low pH. We recommend that you check your pH level after a rainstorm to see how it may have affected your pH level. It is important to point out that variations do exist in different brands and types of chlorine. And those variations can have an impact on the proper balance of your pool water’s chemistry. Often, the “great deal” you got on that chlorine from some discount store, turns out to be a bad deal. Also, minerals that could add to a calcium issue in your pool can come from some pool chemicals. Ask for our advice when you’re hunting for the right chemicals for your pool and spa. We love our pets in Southern California and may of our dogs love a refreshing dip in the pool. But, did you know that your dog may be contributing to poor purity in your water? While some breeds shed a lot and that hair can be a problem, most of it is picked up by the skimmer and filter. The real problem can come from flea and tick treatments and shampoos. Just be aware of this issue and keep an eye on your pool’s chemical balance. Phosphates can introduce algae into your pool water. When Algae blooms, which commonly happens a couple of times a year, it can wreak havoc on your pool chemicals. Phosphates commonly wind up in your pool from lawn and garden fertilizer, your water supply, some cosmetic products as well as some pool chemicals. When the wind blows, or your sprinklers run off into the pool, you end up with phosphate levels that foster algae growth. If you’re seeing this problem, it is a good idea to identify the source and remedy the problem because your pool chemicals will be working overtime to offset the problem. Your pool’s chlorine and other chemicals will lose their effectiveness over time. Much of this is caused by the Sun’s UV rays. With salt water pools, this can be a problem at a faster speed. The use of a chlorine stabilizer can help as it acts as a sunblock for your chlorine. If you have any issues that need a professional’s expertise, please give us a call. We’re always glad to be there for you when you need us.